Layday came early for the Audi Hamilton Island Race Week fleet despite best efforts by the race committee to get some divisions racing out on the Eastern course area, in the Turtle Bay vicinity. 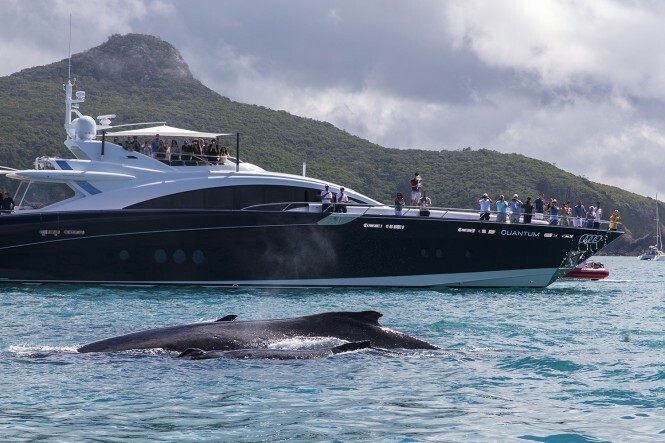 That fleet of cruisers and cruising multihulls waited patiently offshore for close to four hours, filling in time swimming, sunbaking, barbequing and following three humpback whales which obligingly glided close enough for photo opportunities. “It was a frustrating day, we did what we could,” said principal race officer Denis Thompson. “There wasn’t stable breeze to send the championship boats out, we got away with it yesterday, but didn’t want to risk it today given the forecast. The rest of the fleet was moved around all over the place and even went into a starting sequence, and then the breeze collapsed. Everyone tried their hardest; Huey didn’t play the game today.”The Australian Yachting Championship fleet never made it off the dock, an early postponement signalling the long islands race from Dent Passage was cancelled. Hours later those crews were officially released to enjoy the afternoon at Hamilton Island. Day three’s forecast was always going to be challenging for the race committee with very light winds under 8kts predicted to oscillate between north and east.Despite a brave effort to lay a windward/leeward course for the Eastern fleet, when a light north-easter finally set in, the cow bell was rung on the water early afternoon and all racing was abandoned for the day. Wednesday’s layday means the record Race Week fleet effectively now has a mid-week weekend breaking up two halves of the annual series that wraps up on Saturday, August 27, 2016.